Does your favorite strategy give you this benefit? Want to find out how much more lifetime wealth you may be able to have by making major purchases this way? Request a free Analysis now. Find out more about Authorized Advisors. 15. Your plan has a guaranteed value at "maturity." If you pass on before then, your family and/or favorite charities receive a guaranteed and predictable benefit that can be many times larger than the current value of your plan. And it passes to them income-tax free, according to current tax law (IRC Section 101). What this means is that your loved ones could even get money you intended to save! How many of these 18 major benefits and guarantees of Bank On Yourself does your best saving, investing or retirement planning method have? As you can see, it’s hard to beat the benefits of the Bank On Yourself method. And how many of the advantages listed above do you wish you had? NOTE: You could lose some of these important advantages if your policy is from the wrong company or if the wrong product is used, or if your plan is structured incorrectly. It’s not as simple as just calling up your insurance agent or buying any old whole life policy. Our experience has shown that fewer than one out of 1,000 financial advisors have the necessary knowledge to implement this properly, so be sure to work with a Bank On Yourself Authorized Advisor (a life insurance agent with advanced training on this concept), who has access to the right companies and products, and has the training they need to structure the plan properly, to make sure you get all these benefits! You can receive a free analysis that will show you how much your financial picture could improve if you added Bank on Yourself to your financial plan, along with a referral to an Authorized Advisor. Your savings or investing strategy must be a strategy, vehicle or product that you currently use yourself, and can prove that you use it with objective documentation, if requested, and you must be prepared to prove it meets or exceeds all 18 of the advantages described above. It cannot be a strategy that involves essentially the same product (life insurance) and method as used for Bank On Yourself, even if it goes by a different name. We must be able to contact you and to gather the additional information to verify the specifics of your strategy. You must be willing to complete an IRS Form W-9 http://www.irs.gov/pub/irs-pdf/fw9.pdf?portlet=3. 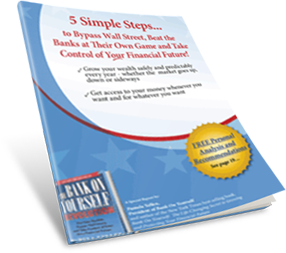 You may not request a confidentiality or non-disclosure agreement for your strategy, and if someone is successful in demonstrating his or her strategy matches or beats Bank On Yourself, the details will be posted on www.bankonyourself.com. The first person to provide the proof described in these rules will receive a check for $100,000 and the Challenge will officially end. Any taxes due on the payment are the sole responsibility of the person who collects on the Challenge. Bank On Yourself will issue a 1099 for the amount paid. We reserve the right to revise or withdraw the Challenge, by posting those details on www.bankonyourself.com, and the change or withdrawal will become effective on the date it is posted. Any dispute arising out of or relating to this Challenge, except for those involving the alleged infringement of Bank On Yourself’s Intellectual Property, that has not been resolved by good-faith negotiations, will be finally settled by arbitration in accordance with the then-current rules of the American Arbitration Association by a sole arbitrator. The arbitration will be governed by the Federal Arbitration Act, to the exclusion of any inconsistent state laws. The final judgment upon the award rendered by the arbitrator may be entered by any court having jurisdiction. The place of arbitration will be Santa Fe, New Mexico. The arbitrators are not empowered to award damages in excess of any lawful limitations on damages provided in this Challenge. The substantive law governing any dispute will be the laws of the State of Arizona. The same statute of limitations applicable in the State of Arizona for the commencement lawsuits will apply to the commencement of an arbitration under this paragraph. Request your free analysis now.